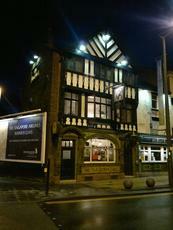 My first pub in Preston on a Saturday night & I have 4 to tick with all being in the Friargate area of town. The Old Black Bull is a Moorhouse’s pub with an original tiled floor, there’ s a small room to your left named the Paddock that has a dart board in it, the L shaped bar starts here and runs through to the main bar. The wooden and brass bar houses 10 hand pumps in banks of 4 and 3’s. All the ales are from the surrounding areas, I go for a pint of Lancaster Duchy @ 3.9% and it's very good. Every hand pump has a price tag hanging on it displaying the price of each ale, I've seen this down South before but not up North that I can remember. I come in just as the band are starting up, I stayed for half and hour and the pub got busier and busier, mostly with an older crowd. A very decent place to start my evening I will return here on my next visit to Preston. Have been here 3 or 4 times, but on my latest visit I twigged what was the most notable feature of the place. It is obviously designed for people who like to drink standing up ! There is no furniture within 8-10 feet of the bar. Further away there are stools and benches, mainly in what were probably originally separate rooms, but they are somewhat down at heel. Several big screen TVs showing various Sky Sports channels are the main attraction. Had 7 or 8 real ales on tap including for some reason several from the Hand Drawn Monkey brewery in Yorkshire. Once again there were no really dark beers available. I tried the HDM Aussie Red which was quite nice. Unfortunately despite the range of ales this place tends to attract large groups of lager-swiggers. 6/10 – not a bad pub, but better when it’s not so crowded ! A busy town pub a bit frayed around the edges. Ale was reasonable but service tended to be based on how well you knew the barmaid rather than how long you'd been waiting.